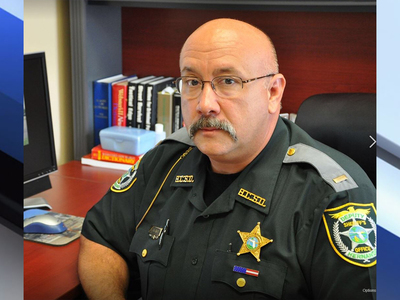 HUDSON, Fla. — A retired sheriff's lieutenant with the Hernando County Sheriff's Office has been charged with initiating a violent attack, stemming from a road rage incident, at a Hudson gas station. The assault victim, who spoke to ABC Action News on the condition of anonymity, says the incident left him fearing for his life. "It could have possibly been the last day for me, you know. To be honest with you, that's what I was thinking." A few honks and hand gestures between two drivers Wednesday along U.S. 19, quickly escalated to a physical confrontation. The victim says the other driver involved in the road rage incident followed him to the RaceTrac gas station off Little Road in Hudson. That's where two men cornered the victim while he was still in his truck, according to a report from the Pasco County Sheriff's Office. The victim quickly pulled out his phone to dial 911, but one of the men smacked it out of his hands. "Two vigilantes that decided to take the law into their own hands," said the victim. ABC Action News has learned, the man who started the confrontation has been identified as former Sheriff's Lt. Peter Ciucci, who spent more than 20 years with the Hernando County Sheriff's Office. "I believe that this man thought he was above the law." Investigators say Ciucci and his son, Nicholas Ciucci, dragged the victim out of his truck, repeatedly punching him in the face, trying to knock him down. The report also states, "the two defendants continued to punch the victim in the back of the head multiple times while the defendant placed the victim in a choke hold. The defendant's son sat on top of him in the parking lot, while the other strangled him from behind." ABC Action News reporter Ryan Smith reached Nicholas Ciucci by phone Thursday night, who had no comment on the arrest. Attempts to reach former Lt. Peter Ciucci for comment have not been returned. Peter Ciucci has been charged with Burglary Battery and False Imprisonment. Nicholas Ciucci has been charged with Vehicle Burglary, Simple Battery, and False Imprisonment.